I am always on the hunt for new dinner recipes that aren't too fussy and are delicious. If you are too, I have to recommend this recipe for Smothered Chicken Casserole that I found at Heather Likes Food. I made some minor changes just to fit what I had already in the fridge. For example the original recipe calls for marinating the chicken breasts in Caesar dressing, but I was out so I used a creamy Asiago Peppercorn dressing instead. The other change I made was what cheese I used. The original recipe called for Gruyere but I opted to use a mix of mozzarella and smoked white cheddar I had that needed to be used up. So in summation this recipe is very flexible based on what you have in the fridge. Many thanks to Heather for the recipe. Enjoy! 1. Marinate the chicken breasts in Caesar dressing for at least 3 hours, up to overnight. 2. Preheat oven to 350-f. Cook bacon until crisp, remove from pan and drain off all but about 2 tbsp of the fat. Heat pan to medium-high heat. 3. Remove chicken from marinade and cook in bacon fat until well browned. (You don't have to cook the chicken through, just get some color on it.) Remove chicken from pan and place in casserole dish. 4. Drain off all the bacon fat from the pan and add 3 tbsp of butter. Once melted stir in the onion and mushrooms. Cook until soft and starting to caramelize- 5-7 minutes. 5. Stir 3 tbsp of flour into the onions and mushrooms and cook for 1 minute. 6. Stir broth and cream into the flour mixture, bring to boil -constantly stirring- for 2 minutes. Remove from heat. 7. Stir in salt, pepper, lemon juice, cheese, and parsley and pour over the chicken in the casserole dish. Top with fresh tomatoes and bake, uncovered for 20-25 minutes or until the sauce is bubbly and chicken is cooked through. 8.While the chicken is baking, cook 1 lb angel hair pasta on the stove-top and drain. Remove chicken from the oven, stir pasta into the sauce and serve topped with crumbled bacon and more fresh parsley. Recipe from Heather Likes Food. Sharing this recipe at the following fun link parties. Oh wow, this looks really tasty!!! Thanks for sharing. I too am always wanting easy dinners. Don't have time for elaborate recipes! This looks really, really good and great comfort food for colder weather! cheese, cream, bacon?! Oh yeah...it's gotta be good! Found you at Lady Behind the Curtain! 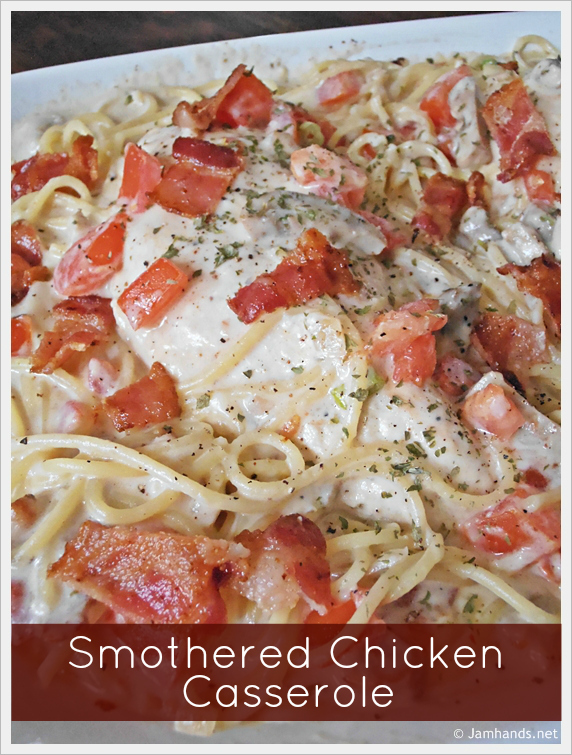 I recently made a Smothered Chicken and next time I will be trying your recipe, it looks delicious. Thank you so much for celebrating TWO YEARS with FULL PLATE THURSDAY, I appreciate your visit! Oh yum!!! This sounds like the perfect comfort food! I have to pin this. I too am always looking for new casseroles for my family. I like how you changed it up to fit what was in your fridge! Thanks for sharing at One Creative Weekend! This look amazing! Pinned, and I cannot wait to try it!